When the Census Bureau releases retail sales data at 830am on Valentine's Day, it will be the first time in two months that markets have gotten an update on the state of US retail spending, as the January release was postponed due to the government shutdown (Thursday's release will be for December data). 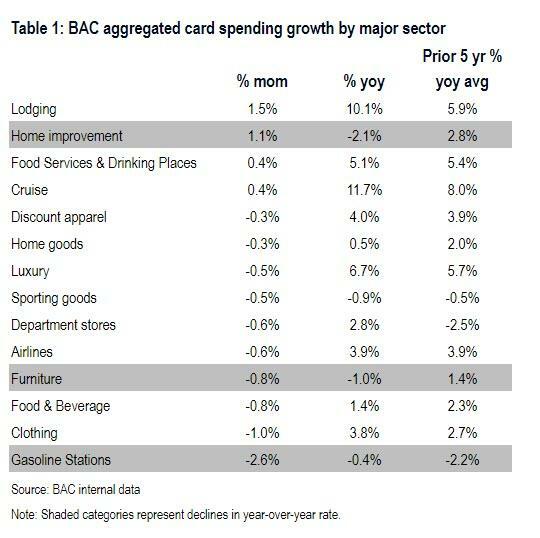 And if Bank of America's proprietary card spending data is any indication, it's set to be a doozy. As BofA's economists summarize the latest internal spending data, consumer spending weakened at the turn of the year, following a period of solid performance. In fact, retail sales ex-autos, as measured by the aggregated BAC credit and debit card data, tumbled 0.3% month-over-month seasonally adjusted in January - the biggest drop in three years. This follows a flat reading in retail sales ex-autos in December. To see whether this moves the needle on aggregate spending, BofA focused just on the DC metro area where 11% of workers are employed by the federal government. However, the bank did not find evidence that spending in DC was weaker as a result of the government shutdown. This suggests that although government workers reduced spending, it was not large enough to move the aggregate numbers. So there appears to have been little discernable direct impact but there may have been indirect effects on spending through impaired confidence more broadly. Nonetheless, an interesting takeaway is that the impact on spending generally grew with time. 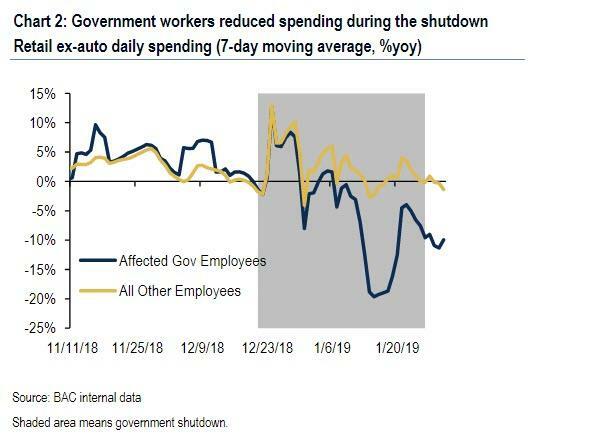 If the government were to shut again later this month, BofA's economists warn that the risk is that consumers respond more quickly by reducing spend given that confidence is already impaired. 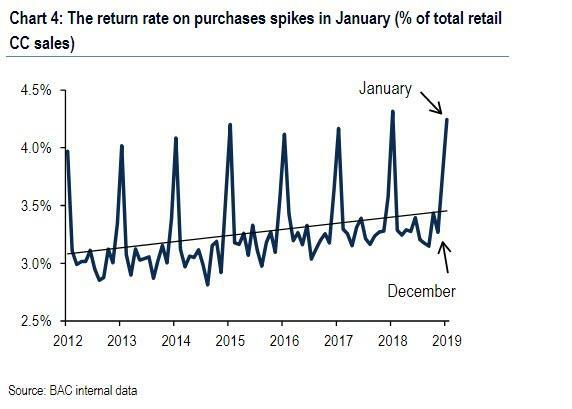 One other key consideration for the January data was the high rate of returns as 4.2% of total BAC credit card sales were returned. Similar to the Census Bureau, BofA's analysts subtract returns out of the monthly sales data. The rate of returns has been on the rise as "free returns" have become more prevalent. This means we will likely see even greater volume in November and December but less in January, adding to the noise in the data. 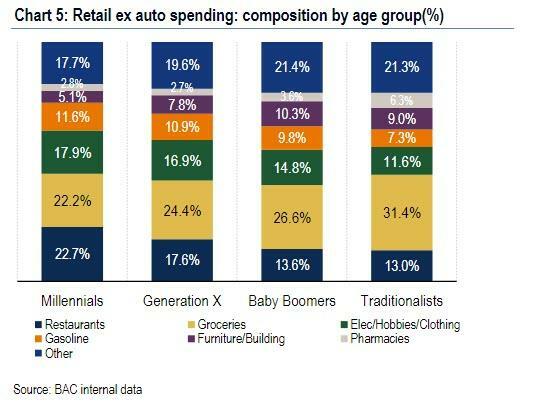 Finally, while not directly related, BofA also looked at the shopping cart by demographic cohort. It found that the most obvious difference is regarding food spending: Whereas Millennials spend more on restaurants - around 23% of spend - baby boomers allocate just under 14% to restaurants. The opposite is true for groceries with the older generations spending more. Millennials also tend to spend on electronics, hobbies and clothing while Boomers will spend on furniture and building materials. This makes sense given that the homeownership rate for under 35 is 37% but is 70% for those between 45 and 54 years old. Millennials also spend a larger share of their budget on gasoline than the two older generations. This shows that despite the move toward a "sharing economy" which means greater ride sharing, Millennials still own cars. 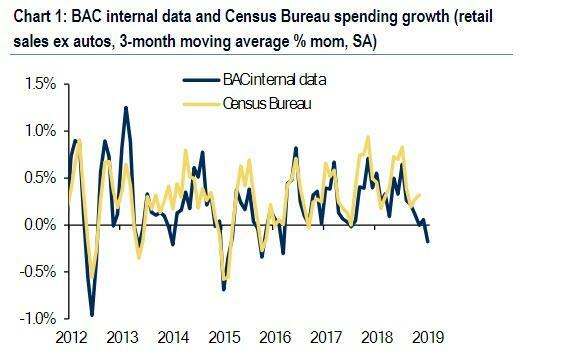 If the Census Bureau confirms this sharp drop in card spending, it will confirm that US consumer have indeed hit a break wall just in time for the Fed's dovish relent, and if bad news continue to be good news, Thursday's data has the potential to send stocks soaring as it would assure no more rate hikes this cycle.